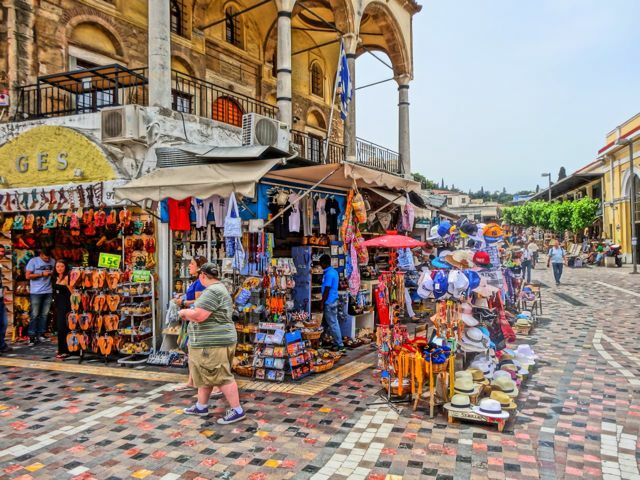 Shopping in Athens is a favorite pastime for tourists and Athenians and one of the best places to buy just about anything is the Flea Market at Monastiraki. OK. It is not really a flea market except maybe on Sunday when some of the stores close and people bring tables and carpets and sell all kinds of stuff from junk to antiques. The rest of the week it is more like the Grand Bazaar in Istanbul though not so grand and not so bizarre. 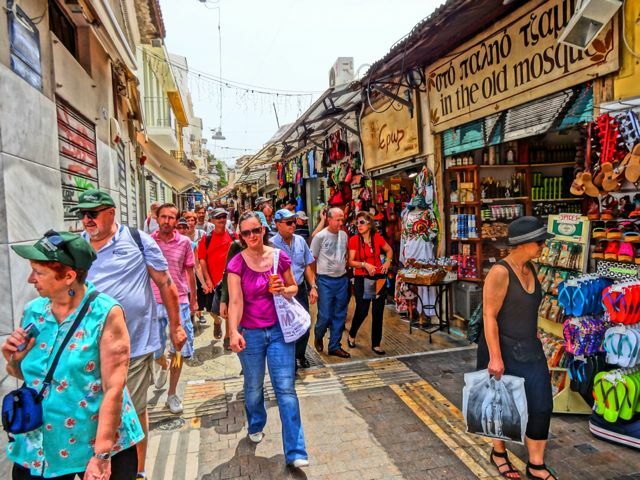 Most of the shops are pretty conventional and sell the same stuff you find in the tourist shops on the islands, some of it made in Greece and some made in China or other cheap labor countries. You will find the same designs on GREECE T-shirts as you saw in Aruba or Mexico, as well as some you might actually classify as art or somehow unique. There are good jewelry store with handmade gold and silver pieces and fake jewelry stores with "handmade" gold and silver pieces, and most people won't be able to tell the difference. 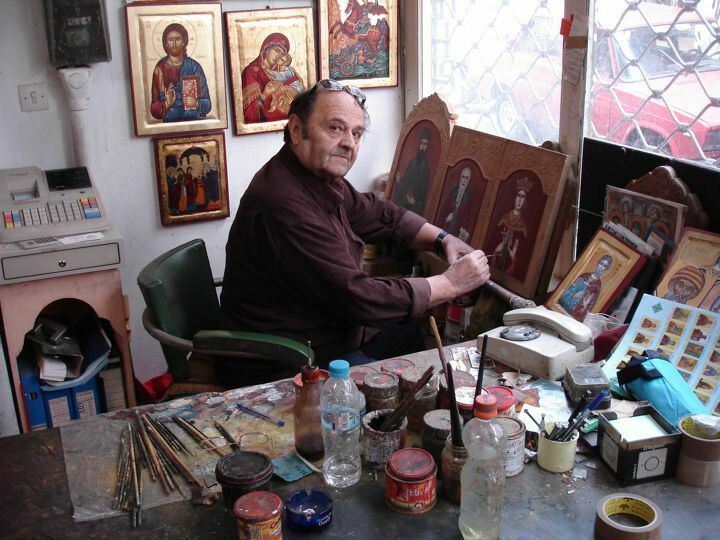 There will be shops with icons painted by monks from Mount Athos and monasteries around Greece and other shops with icons painted by armies of artists in workshops, or just prints pasted on wood or particle board. Let's be honest: to most people an icon is an icon. There are more people in the world who buy crap than there are people who buy something because it is authentic art, and the shops of Monastiraki cater to the masses. You will find everything you want here from jewelry to trinkets, from original designs to mass produced T-shirts advertising not only Greece but stuff that needs no advertising like Nike and Adidas and Coca-cola or your favorite heavy metal band. You will find antiques and fake antiques, vintage vinyl and not so vintage CDs. Rare first edition books in all languages and the same paperback you thought about buying at the airport. You will find plastic worry beads and the real thing, bouzoukia that can't stay in tune or hand-crafted instruments that will be coveted by your musician friends. 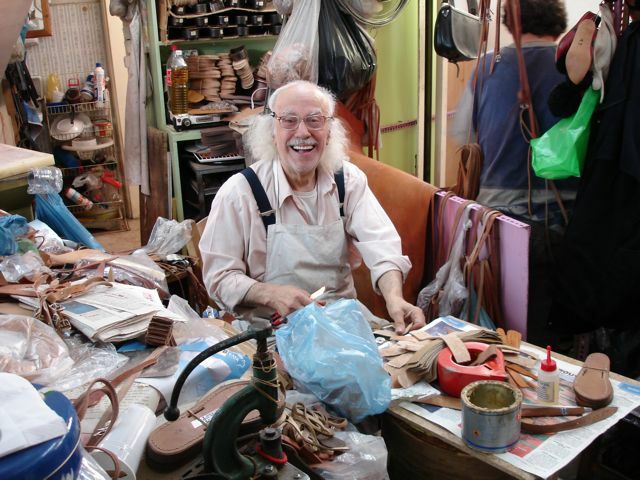 You will find sandals made by Chinese factory workers or made right there in the shop and fitted exactly to your foot. Monastiraki is a marriage between what is fake and what is real. Most people want the fake stuff believe it or not. It is cheaper for one thing and they can't really tell the difference for another. But for those who know quality, wandering through Monastiraki is not a hopeless endeavor as it may appear to you on the surface. There are some very cool shops here, that you won't find in your local mall, or even in the Grand Bazaar of Constantinople. You just have to look for them and learn to recognize them. It may take turning down a small side street that the doe-eyed masses are oblivious to as they wander in droves down Hepheston Street and Pondrossou. It may mean crossing Ermou and going into the narrow streets of Psiri. But there are real pearls scattered among the dimestore trinkets and mass-produced pottery and sculpture, and the challenge is finding them. 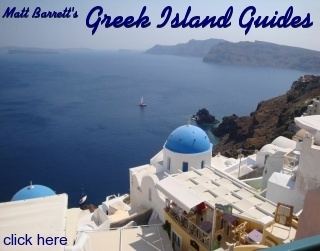 Unless of course you are just looking for a gift to prove you were in Greece or to show someone that you were thinking of them during your holiday. In that case you will be as happy as a pig in a poke. (Whatever that means). The Monastiraki flea market is the place to be on Sunday when it seems every Athenian is here either buying or selling. You have to get here early because after about 11am the crowd becomes impossible and if you want to take a break there are few tables available at the many cafes and restaurants in the area. You can wander around aimlessly or you can find someone who knows the flea market who can show you around if you are intent on buying something in particular. Much of the flea market is not really a flea market. 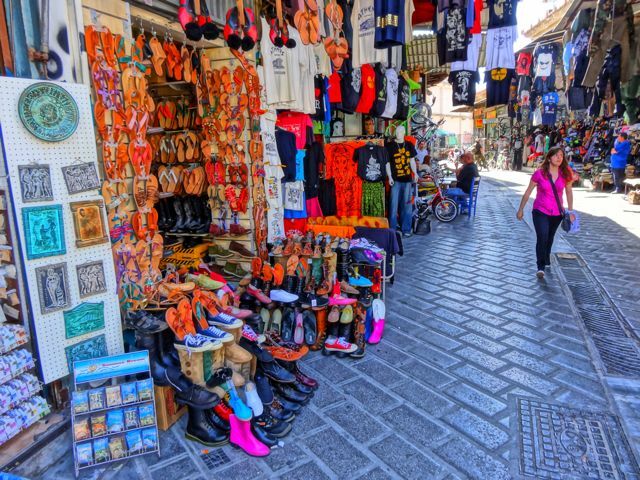 It is a collection of small shops of which most of them are tourist shops with the same stuff you will find on Adrianou street in the Plaka. These are open normal shop hours and you can come here anytime. But weekends and Sunday in particular is when it is like a third-world flea market with people selling anything from antiques to what you might call useless junk and it goes on forever, beyond Monastiraki and into Thission and Psiri. 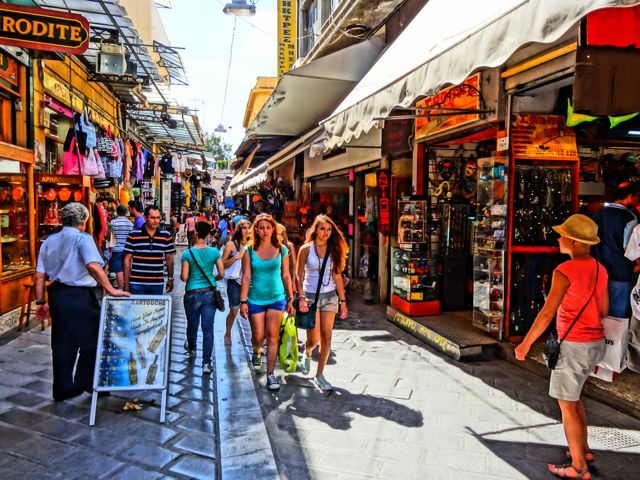 Getting to the flea market is easy and the best way to get your bearings is to find Monastiraki Square which is a center of activity day and night. If you are coming from Syntagma you will be walking down Metropolitan street, past the Cathedral with the scaffolding holding it together and the square of shiny marble. (There is a small Byzantine church in the shadow of the cathedral that you should take a look at called Agios Eleftherios. Nearly every stone of this little church was taken from an ancient building or older church including the stone from Galilee where Jesus changed water into wine. The church used to be called Panagia Gorgoepikofos which means the Virgin Who Grants Requests Quickly and inside is the Icon which they say performs miracles). There are some cafes in the square and this is where Pandrossou street begins. This section of Pandrossou is the high end section of Monastiraki. Pandrossou Street will take you right to the square. 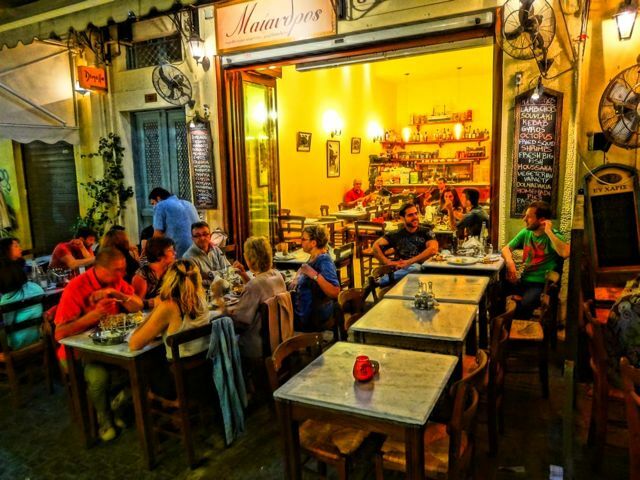 If you are coming from the Plaka, near the end of Adrianou street you will come to a small square, every inch of which has been taken over by fancy tourist restaurants and cafes. Hurry through it until you come face to face with Hadrian's wall. You can't miss it. The stones are massive. Turn right and then take a left down tiny Pandroussou Street. (If you need to ask directions remember Bonanza: The Ponderosa). You are now in the tourist infested heart of the so-called Monastiraki Flea-Market. But Keep walking to where Pandrossou becomes narrow and the shops get a little smaller and deposits you in the square. 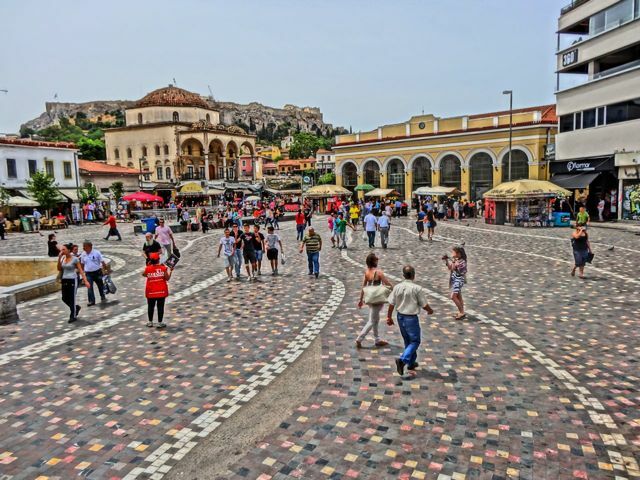 If you are coming down Athinas from the direction of Omonia then if you keep the Acropolis in sight you will come right to Monastiraki Square and the entrance to the flea market. The train station is on your right and Pondroussou street will be on your left just past the souvlaki shops and cafes. Hepheston Street is to the right of the metro station and the most interesting shops are down here. Of course the easiest way to get here is going to the nearest metro station and taking the train to Monastiraki. If you are coming from the Acropolis Station you have to change trains at Syntagma. You can also walk from Makrianni on Dionysiou Areopagitou, the big pedestrian avenue that circles the acropolis and as long as you stay on that road with the archaeological site on your right, you will come out in Monastiraki, though at the bottom and then you can make your way back up to the square. Much of the action is further down behind the metro station. Walk down Efestou street to the right of the train station and take your second right into Avisynia square. If you are lucky, the Abysinia Cafe will be open. Tables and chairs will begin to fill the square as the merchants pack up their remaining merchandise. More then occasionally there is live music and dancing in the streets in the afternoon. If it's not Sunday it is an area of tiny interesting shops most of them selling antiques. If you continue through the square you will come to Ermou and if you cross into Psiri there are people selling there too. The further you go the weirder it gets and by the time you get down towards Pireos street you have very poor people buying and selling from piles of rags and little gypsy children running barefoot. If you are looking for inexpensive reading material, there are several used book stores in this area selling mostly paperback books. There are also old coin, stamp and print shops, mini-army-surplus stores where you can buy actual machine guns left over from the Nazi occupation. They look more like garden tools than guns and you probably won't be able to get them through customs but if you are into that kind of stuff, these stores are worth looking through. What to Buy? Anything that looks interesting. As noted before, Sunday is the best day to be here because you never know what you will find. But on regular shopping days the tiny shops contain everything from worry beads, furs, backgammon sets, toy evzone soldiers, ancient Greek bottle openers and cigarette lighters, Byzantine Icons, paintings, statues, postcards, high fashion such as T-shirts, handbags with pictures of the Parthenon and so on. (For jewelry see Byzantino .) If you find a deal that is too good to be true for ancient Greek, Roman and Byzantine coins keep in mind that there is a good possibility they are fakes and that if they are real you are not supposed to take them out of the country and you could get arrested. There is a huge market in used phone cards, the same way Americans collect baseball cards. If you buy a set you will probably be the only person on your block who has them. There are a couple old print shops that are worth checking out. Overlooking Monastiraki square, and across the street from the metro station is the restored Turkish Mosque, now the traditional ceramics museum. Called the Tzistarakis Mosque, it was named for the Viovode (governor) of Athens who had it built in the mid eighteenth century. The building of this mosque released an ancient curse. Using parts from the ancient buildings of Athens, Tzistarakis went too far when he dynamited one of the last remaining columns of the Temple of Olympian Zeus to complete his mosque. The Athenians believed that each column stood upon a curse, holding it within the earth. The destruction of the column coincided with an outbreak of the plague and the people of Athens blamed him. However ancient monuments according to the law were property of the Sultan and could not be used without his permission. Tzistarakis was removed from power and they say the temple of Olympian Zeus lamented the loss of it's column so loudly at night that nobody could get any sleep. This finally ended when Tzistarakis was poisoned. Right next door are the large columns and ruins of the Roman Emperor Hadrian's Library and the Roman agora. This is the street where many of the street venders are and if you go up and take a right on Adrianou the road runs parallel to the metro tracks and the ancient Agora with the Stoa of Attalos museum. Here you will find several cafes, ouzeries a couple restaurants and lots of people selling stuff right on the street, and plenty of interesting people. It is not only a good place to hang out on Sunday afternoons but any day and at night it is one of the nicest areas to go for dinner or drinks or a bit of both. Some restaurants like Meandros, at 47 Adrianou Street, have live music, usually one or two guys with a guitar and bouzouki playing popular Greek songs. Some of the hipper places may have jazz. 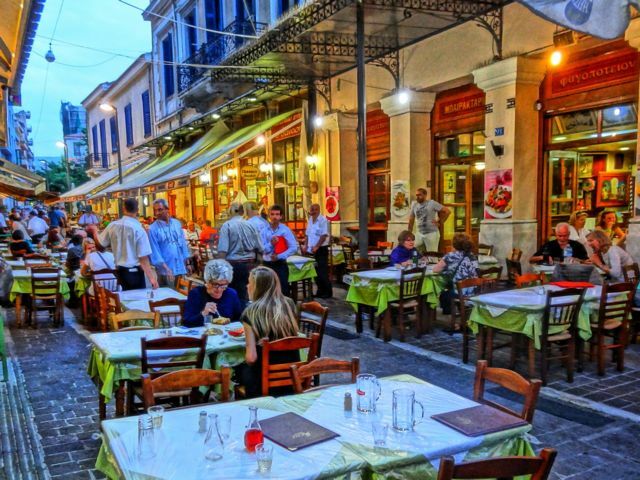 Like the Plaka, many of the restaurants are for the tourists, though since they have to be open year round and tourists are not there year round, they have to be good enough for the Greeks to want to eat there too. The ouzeries and cafes and more modern places serve more interesting dishes and may even have a real chef making Greek, Italian and French bistro style food as well as nice pastries and of course mezedes to go with ouzo and tsipuro. The entrance to the ancient Agora is about half way down the block on the left and you will see the Thission, the almost completely intact ancient temple that is actually a temple to Hephaestus. If you have not wandered around here yet then you should. You can cut through and go to the Acropolis. There is an entrance fee but there is a way of going up through the Agora up Areos street that is free. 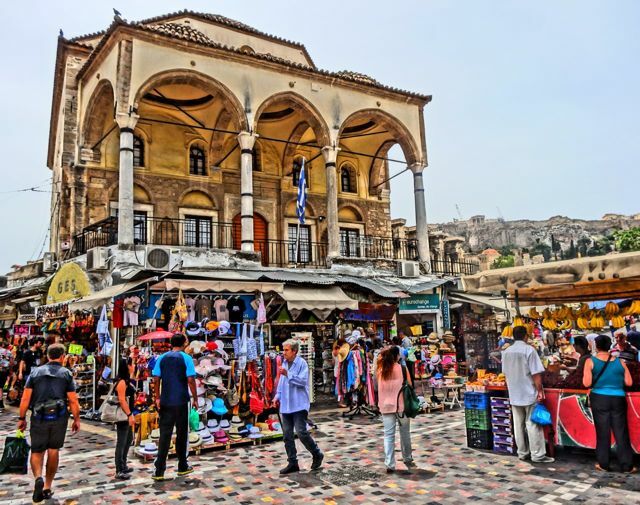 If you walk up from the train station you will notice a community of Greeks and foreigners who sell imported and handmade jewelry, beads and other paraphernalia on the street. It is a stressful job because the police are constantly harassing them and making them take down their displays, sometimes confiscating them and making them pay a hefty fine to get them back. "It's like a game" says one of the street merchants. "They come. They harass us and make us take our stuff down. They leave and we set up again. It makes doing business very difficult. But we can't get a license to sell on the street and we don't sell enough to open a shop. The law does not allow us to get together as a coop and open our own shop either. Yet people like our stuff and buy. It is typical. They harass us and fine us but they don't offer any alternative. We are not criminals. We are artists and merchants. People need money to eat and some of us have families to support." 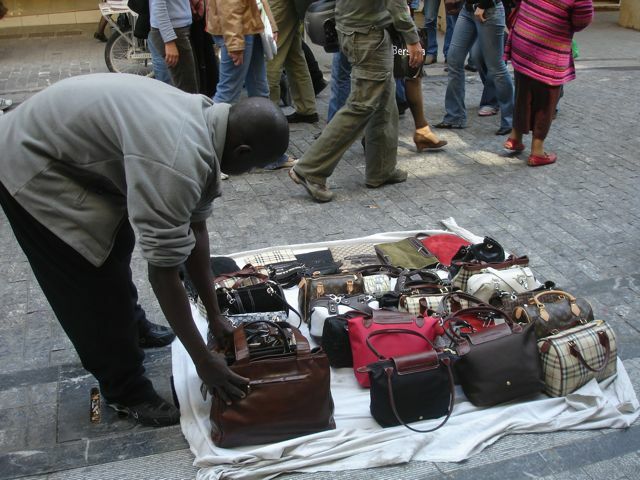 Another group of merchants are the Africans who sell leather bags, CDs and even African products. You will see them walking down the street carrying white sheets filled with their merchandise. When the coast is clear they will find a spot and lay out their wares. If a lookout signals that the cops are coming they are gone in about 5 seconds flat. Another stressful way to make a living. If you are like me and want to do what I do on Sunday come very early and go to one of the cafes on Andrianou right in the flea market between the Stoa of Attalos and the entrance to the Ancient Agora. If you are going to the Sunday market come here early because it fills up. They all serve coffee beer or drinks and it is a good spot to watch the people go by. And if you are still here in the afternoon and evening it is a great place for ouzo and mezedes. Diodos make a nice seafood pikilea (assortment) and also one that features grilled meats if you can't decide what you want. If you can't find a seat at one place there are plenty more cafes along the fence which borders the ancient Agora some as good and some better than Diodos and most serving a pikilea of some sort. You can watch an endless parade of people walk buy and be entertained by street musicians. Don't leave your cell phone on the table though. Cute looking children selling tissues and other things will lay their ware on top of your phone and when they leave the phone goes with them. Not everyone is a shopper. Some of us are people watchers and Sunday in Monastiraki gives you plenty of opportunity to do just that. Don't forget the best souvlakis are in Monastiraki at the end of Metropolis street, either at the restaurant owned by the famous Sprios Bairaktaris. (You will know the place by the pictures all over the walls of Spiros with Greek politicians and celebrities.) Or at Thanasis, across the street, the favorite place of all the taxi drivers. Are these really the best souvlakis? Probably not. You can probably go to any neighborhood in Athens and find better, but these have been known as the best souvlakis for so long that it is just sort of accepted. If you don't mind walking a little find Aeolou Street and walk away from the Acropolis. There is a small square next to Agia Irini Church, a block past Ermou street and in that square is Kostas which in the opinion of some souvlaki experts is the best. Oh and I almost forgot: If you walk up Aeolou to Mama Roux at #48-50, they serve Sunday Brunch starting at 11am. For a place to have coffee, or food and drinks with a spectacular view, that is not on the street but well above it go to Poikili Stoa at 14 Agiou Filippou Street which is behind the church across from the entrance to the Ancient Agora. It's an unassuming little place, at least it appears that way from the entrance which looks like a little snack-bar with a couple tables out front. But walk in, past walls filled with original art, and up the stairs and you will be treated with one of the best views of ancient Athens. At night they play jazz and blues. Or they did. I have not been there lately. Just across the excavated ruins on Adrianou is the James Joyce Pub, a real English pub with a good selection of beer, and food that is better than most pubs. 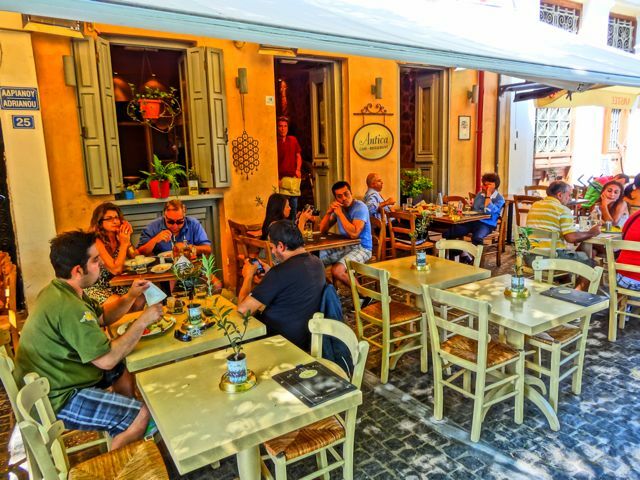 If you want to get away from the crowds and have a drink or a snack try going to the intersection of Ag Filipou Street and Ermou to a colorful little cafe called Kafeneion to 111. They stay open until 2am and on some nights there is live music, usually some young people who show up to eat and drink and bring instruments with them. From Monastiraki square if you go down the small Ifaistos Street, which is the fashion capital of Athens if you are a teenager or in your twenties, are some of the best record and CD stores you will find anywhere. 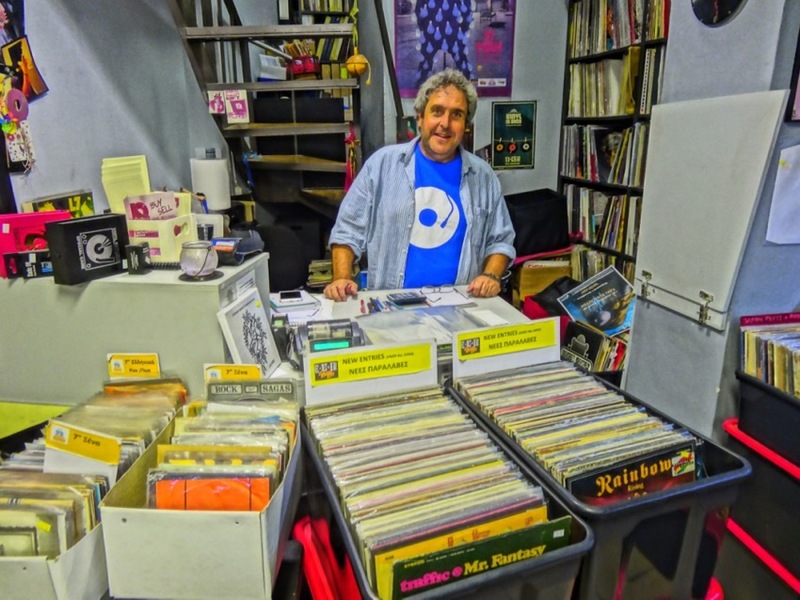 If you are the type of person personified by John Cusak in the movie High Fidelity who lives for music, especially stuff you can't find anymore, check out the little alley at #24 Ifaistos. There are several used record stores and CD shops including OX AMAN Market. I guarantee that even if you are a collector you will find things you don't have and did not even know existed. For serious collectors walk across Monastiraki square and cross Ermou Street at the A is for Athens Hotel and go up Maouli Street about half a block and there is a small road called Agios Eleoysis Street which begins just past the entrance to the Metro Station. About a half a block up on your left is a terrific little record and CVD store called Diskadiko, owned by Iosef Aggelidis, a long time fan of the Greek and International music scene and a passionate collector of albums, art and music paraphenalia and a really nice guy. If you are more of a player than a collector then go check out guitars, bouzoukia, baglamas, santouris, aouds, and many more instruments at at Mousika Organa at Hfaistos 36. Yannis Samoyelian makes and repairs stringed instruments and also has electric guitars, keyboards and less traditional instruments. Plus he carries songbooks of rembetika and laika music. Good place to go if you need strings too. If you are a guitar player and don't want to risk taking your valuable instrument to the islands you can buy a decent cheap one here and he might even buy it back from you after your trip. If you cross the square and go two blocks up Pondrossou Street's collection of tourist shops there are a couple shops worth visiting. One is Byzantino Jewelry on the corner of Aeolis (featured in the Plaka section) where they have their main store. They speak English and have quality stuff. My wife is a jeweler and she buys handmade 22k gold pieces from them wholesale and sells it in the jewelry store that she has her work in. A little further and you will come to the Athens Gallery, owned by the famous sculpture artist known as Apostol. Located at 14 Pandrossou Street the Athens Gallery contains examples of all major Greek arts, crafts and ceramics. You can see work from the mainland as well as the islands of Greece and many of the workshops that have built up the Greek artistic tradition contribute to the gallery. A number of leading Greek artists and sculptors, many of whose work can be found in famous collections in Europe and further afield, display some of their finest work here. And because it is a shop it is free to enter. If you continue to walk up Pondrossou Street to the square where the Cathedral of Athens is located you will see the small Byzantine church of Agios Eleftherios, both well worth going in to see. To the right of the small church is a street called Mpenizelou Palaiologou and at #3 is the renown Dimos Jewelry, an institution for over 50 years. Owned by Sotiris Dimos and his talented son Stavros, this is a must visit shop for anyone who loves jewelry. If you want to continue on for more entertainment keep walking into Psiri and find more shops, an ouzerie or cafeneon to spend the rest of the afternoon eating, drinking and talking. Further down Ag Theklas there are a couple other very interesting shops including the Zazanis Icon Shop at #13 where you can buy hand painted original icons rather than the cheap decoupage ones that many of the tourists end up buying from the crappy tourist shops in the more commercial parts of Monastiraki. Zazanis is himself an accomplished icon painter and he also carries the work of several other icon painters so you have a variety of styles. 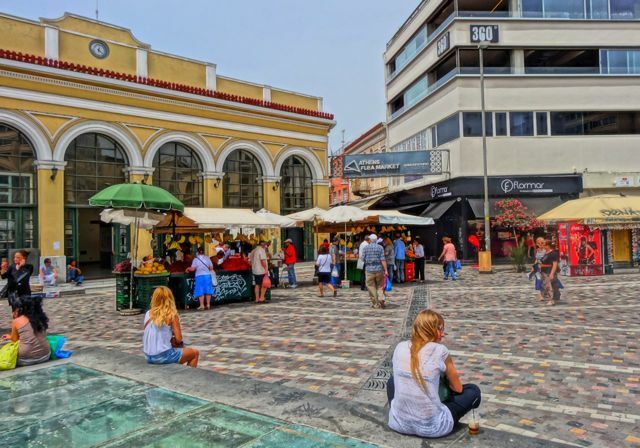 As I mentioned at the top of the article the main part of Monastiraki which is Pondrossou and Hepheston streets, on opposite sides of Monastiraki Square, and called the 'Flea market' is really nothing like a flea market. Its a bunch of typical tourist shops mixed in with the kind of footware and clothing shops you would find at a mall. There are a few interesting shops squeezed in that sell unique things like antique prints (and fake antique prints), collectable LPs and CDs (and uncollectable), but you gotta keep your eyes open. But in my opinion the really cool stuff is on lower Ermou and across on small streets like Ag Theklas where rents are cheaper and you don't have to sell thousands of mass-produced items to survive. 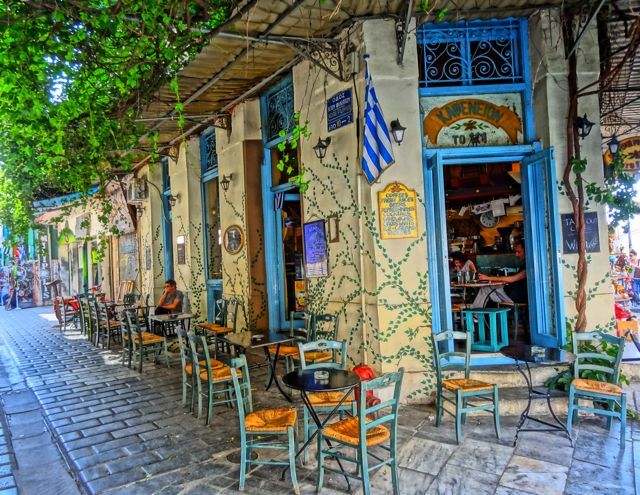 If you seek originality and real antiques leave Monastiraki behind and wander around Psiri. The Monastiraki train station is your key to adventure so don't forget where it is. This is where you can take the train to Pireaus to catch the ferry to the Greek islands. (For instructions on how to do this see my Greek Island Primer: Step by Step Instructions for visiting a Greek Island on your own which includes the mysterious art of buying tickets for the Metro.) So remember where it is, in Monastiraki Square where Ermou Street and Athinas Street meet. You can also get to and from the airport from here. There are two metro lines that intersect here so don't get on the green line if you are going to the airport or the blue line if you are going to Pireaus. Watch your wallets and purses on the metro and in the station and in crowds in general. There are pickpockets active as there are in any city and they are better at stealing wallets than you are at keeping them from stealing it. My advice is to keep valuables and credit cards in your hotel safe and only walk around with as much spending money as you need, one credit card, and a photo-copy of your passport. I use a fake wallet stuffed with ads and worthless pieces of paper and let it bulge from my back pocket. That should not only keep a pickpocket busy but also give you some satisfaction when you find it missing knowing that you annoyed him. The 2-star Hotel Attalos is very convenient and pretty nice for an economy hotel. (This is where I stay when I am in Athens). It has free internet, a rooftop bar with a view of the Acropolis, and you can walk to pretty much all the archaeological sites, museums, restaurant and shopping areas and it is on the metro line for both the airport and the port of Pireaus. For convenience and entertainment it's a good area to be in because at night you have Psiri which is my favorite area for nightlife and you can walk to Gazi which for most people is even better. Even the Plaka is a five minute walk. 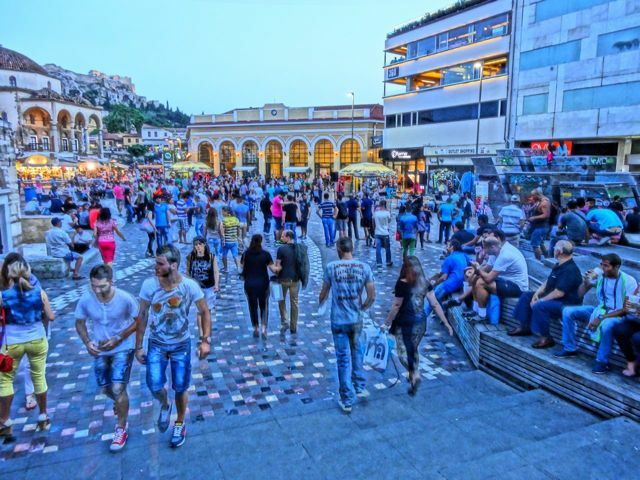 Also very recently lower Adrianou street which borders the metro tracks and the ancient Agora has become a popular nightspot with restaurants, cafes and ouzeries and a parade of people walking by that rivals any pedestrian street in Europe. In the summer there is usually a nice breeze blowing through here too. Other hotels in or around Monastiraki include the 3-star Plaka Hotel which is closer to Monastiraki than it is to the central Plaka. The Hotel A is for Athens which has a view of the Acropolis and Monastiraki Square, as does the 360 Degrees Hotel and Apartments, also right on the square. Both hotels have a rooftop restaurant/cafe/bar with a spectacular view of the square and the Acropolis. 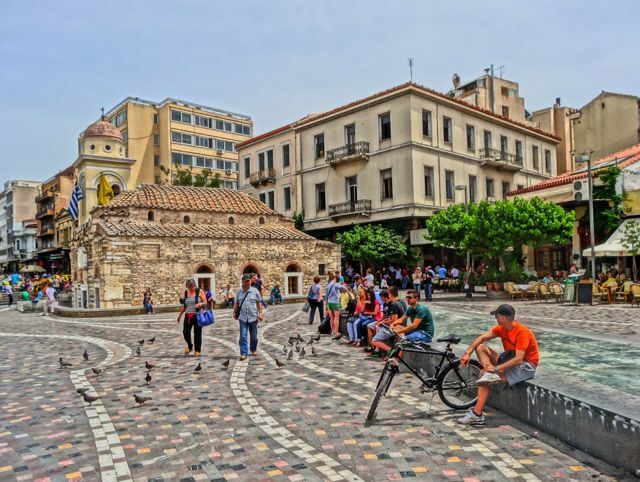 The Athens Center Square as well as the Fresh Hotel which are both boutique hotels in the Central Market, just a few blocks from Monastiraki. The 3-star Hotel Adrian is right between the Plaka and Monastiraki. The 2-star Hotel Cecil is on Athinas Street, a five minute walk from Monastiraki Square. 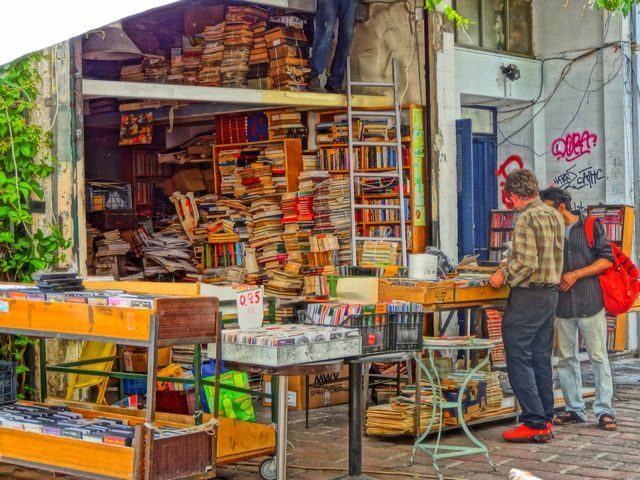 If you want you can take my Monastiraki Tour or see Sunday in Abysinia Square: Athens Antique Paradise. Also see my section on Athinas Street and the Psiri Neighborhood.